Welcome to Cuthbert’s Tea Shoppe! Online Reservations start September 1st! Walk up reservations are on a first come first serve basis. Please come to the Tea Shoppe to check on availability. Parties of 10 or more can email for the 1pm time slot. We may open a 5:45pm Tea if there is interest. Thank you all and have a glorious time at tea and the Great Dickens Christmas Fair! 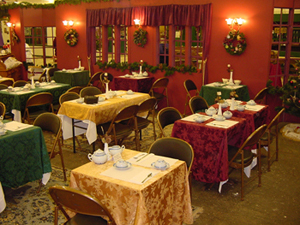 Cuthbert’s Tea Shoppe is the place where visitors to the Dickens Christmas Fair can come and enjoy a nice pot of tea, scones, tea sandwiches and delightful desserts in the midst of the hustle and bustle of Victorian London. Patrons do not need reservations to enjoy tea, but without them, there is a possibility that they may not get in to the shoppe due to its popularity. There are several ways to partake of tea at the shoppe – by ordering items from the menu á la carte or by ordering the Afternoon Tea combination which includes a tea pot to take home. In addition, every day at 4:00 pm we present High Tea. High Tea has a fixed menu and also includes a tea pot to take home. Reservations may be made at the Dickens Fair on the same day as your visit by coming to the shoppe and checking with the hostess to see if there is space available. If they have a group of 10 or more, please email sue@cuthbertsteashoppe.com to acquire a 1:00 time slot. Great Dickens Christmas Fair Tickets are not included. This entry was posted in General by ziokhan. Bookmark the permalink.